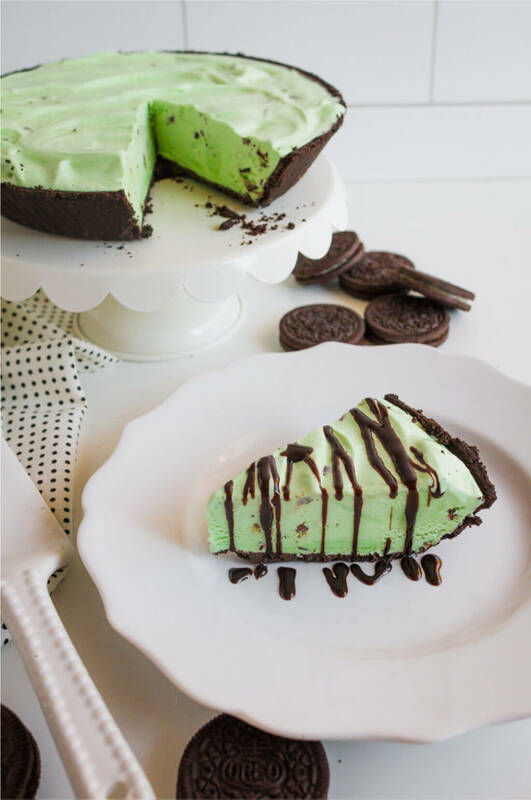 With only a few easy ingredients, you’ll love this Frozen Mint Chocolate Chip Ice Cream Pie! Around the holidays I posted the easiest Frozen Peppermint Pie using my favorite peppermint ice cream. The idea came from a recipe I got from an old college roommate – only I simplified it even further. 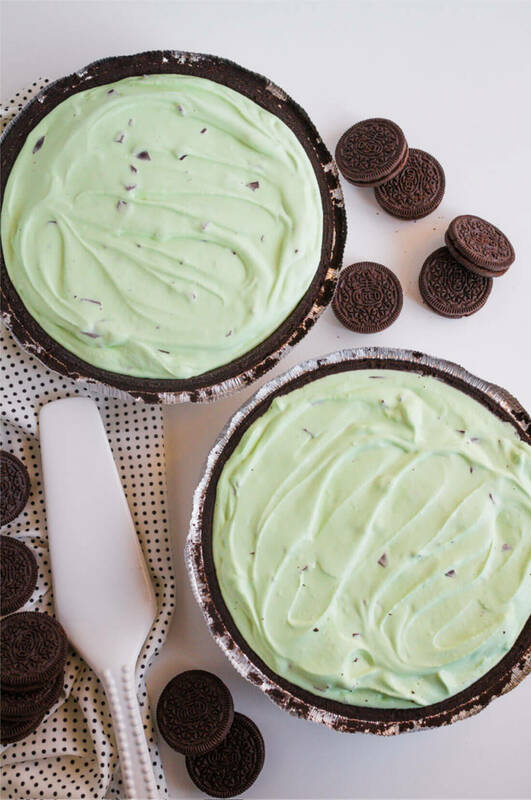 You’ll love this Frozen Mint Chocolate Chip Ice Cream Pie too. My roommate would make the Oreo crust herself with butter and Oreos. You can still do that if you’d like. But when I saw the pre-done Oreo crust at the grocery store, I thought it was worth the money to buy. 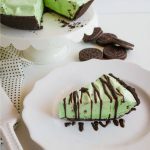 This Frozen Mint Chocolate Chip Ice Cream Pie so easy and delicious – a quick trip to the grocery store for just a few things and you’ll be ready to go. You need to keep in mind that it has to freeze for a few hours, so calculate that into your plan for dessert! *The combination of mint chocolate chip ice cream and Oreos is awesome but you can substitute the ice cream flavor with whatever you want, really. The possibilities are endless for an easy treat to satisfy your sweet tooth. By now you probably know that I most often prepare easy meals and desserts. My family usually likes the simpler things I make anyway, so it’s a win-win. Do you like this quick frozen pie? Then you’re going to love these other pie recipes. Please click each link below to find the easy, printable recipe! If you love this Mint Chocolate Chip Ice Cream Recipe as much as I do, please write a five star review, and be sure to help me share on Facebook and Pinterest! 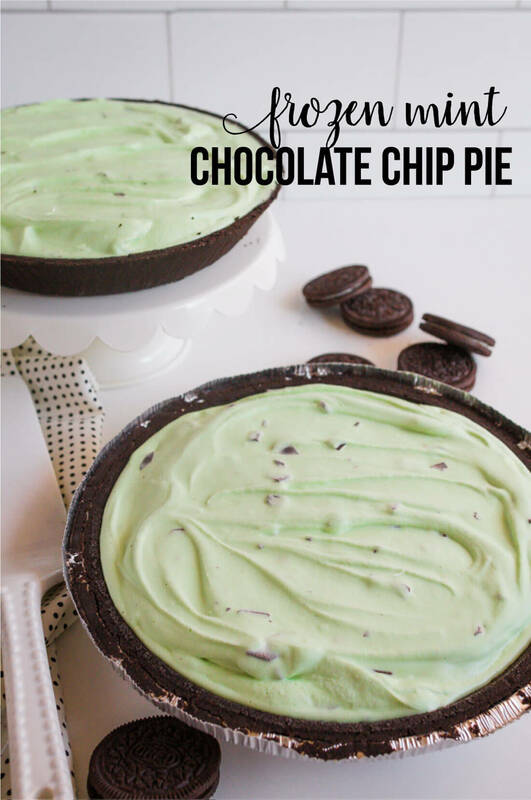 This Frozen Mint Chocolate Chip Ice Cream Pie takes only 3 ingredients, is super easy, and so yummy. Plus, you can substitute the ice cream flavor with whatever you want - the possibilities are endless! Soften ice cream until easy to mix with cool whip. Spread into cookie pie crust. Optional: Top with crumbled oreos or chocolate sauce. I made the mint chocolate chip and my boyfriend and friends ate them up! And I recently made cookies and cream and chocolate and they are both delicious!! I have a new favorite ice cream ~ Blue Bell mint cookies and cream. And it will be so good in this pie! Mmm can’t wait! This looks amazing and I want to try it, but do the ingredients make two pies or one? My family isn’t very big on desserts, besides me, and so if i make too many I’ll have to eat it all by myself. Which… now that I think about it… might not be such a bad thing…. Genius! That is my favorite ice cream. Making this! I love your blog. Thanks for all the inspiration! Love Mint. Yummy! Pinned. Thanks for sharing!! oh my gosh I have GOT to make this for my daughter, she is on a huge mint chocolate chip rush lately! YUM!!!! Mint Chocolate Chip is my favorite ice cream! With oreo crust? Done and done! Totally making this! Oh this pie looks so yummy! I love to bake and make desserts but finding the time is so hard these days. This would make a great weekend dessert that my kiddies will love!